This is an introduction on how you can exchange information between a micro:bit and a Raspberry Pi using Bluetooth Low Engergy (BLE). Based on work at https://github.com/ukBaz/python-bluezero. We will use https://makecode.microbit.org to create our own hex file with the required Bluetooth services for this workshop. If there are not the Bluetooth commands on the left hand side then click on the cog and choose Extentions. From the list of Extensions, choose Bluetooth and accept that radio will be replaced with Bluetooth. Before saving the program to the micro:bit, click on the cog and select Project Settings. Choose the JustWorks pairing mode. The micro:bit with this hex file will need to paired with the Raspberry Pi, more on that later. For now we are done with the micro:bit and can switch to setting up the Raspberry Pi. If this is the first time this combination of Raspberry Pi and micro:bit have been used together then you will need to ensure the micro:bit is in the list of known Bluetooth devices that are paired with the Raspberry Pi. The pairing will be done using bluetoothctl. Note: There is ‘tab’ command completion on commands and addresses available within the bluetoothctl tool. The command line tool “bluetoothctl” to discover the micro:bit. Type help to get a full list of the commands. Type show and check that you have Powered: yes. You will need to get bluetoothctl to search for micro:bits that are nearby. When you see your micro:bit you can stop the search. Using the Bluetooth address of the micro:bit (found with the above command) to connect to it. Because pairing is required with this hex file the micro:bit needs to be put into pairing mode. To do this, hold button A & B and then press and release the reset button on the back of the micro:bit. 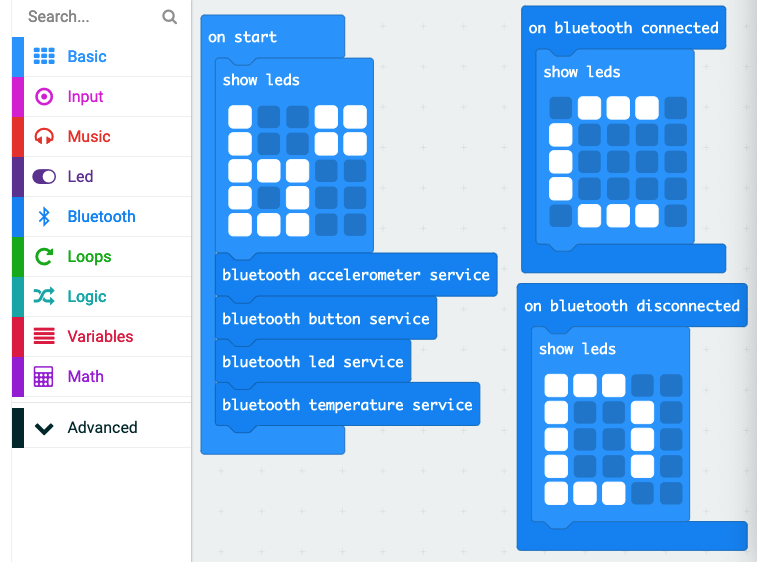 Once the Bluetooth logo is displayed on the micro:bit you can release all the buttons. This first Python exercise is to send text to display on the micro:bit. This last exercise uses information from the micro:bit sensors to be displayed ont he Raspberry Pi.